It can be hard to find the time for a good brushing between lunch and that important afternoon meeting or getting the kids to ballet. By the time the end of the day rolls around that tasty Italian sandwich for lunch is marching around in your mouth like an invading army. These tips and a little planning, help keep healthy dental habits part of everyone’s busy day. Regular brushing and flossing help prevent gum disease. Gum disease develops from bacteria that builds up in the mouth. Regular brushing and flossing help clean away the bacteria and help prevent plaque from forming and causing gum disease and other health complications. Davis, a family dentist in Paso Robles since 2007, recommends keeping dental care kits in the car, the desk at work, in kid’s backpacks and gym bags. Follow these tips to establish easy dental care habits even during the busiest days. 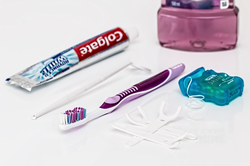 Pack a toothbrush or consider buying packages of pre-pasted disposable toothbrushes. Use it once and throw it away. Flossing on the go is not always convenient. Most people floss at least once a day, but there are times when that emergency afternoon floss is needed. While not the best solution for a daily flossing routine, floss picks are a good tool for an unplanned floss. Sugar free gum, breath mints or breath freshening strips are good alternatives to carrying around bottles of mouthwash. Gum can also help remove excess food from around teeth. Keep hydrated. Water is great for your body, helps neutralize the acid in your mouth and is easily available in normal situations. After that afternoon cappuccino drink some water to help your teeth and mouth return to normal. Keep healthy snacks handy. Instead of turning to that mid-afternoon candy bar, eat an apple or some carrots or almonds. Lisa Lu Davis, DMD has provided personalized dentistry in Paso Robles since 2007. Dr. Davis’ office uses state-of-the-art technologies in all procedures. These new technologies allow dental concerns to be detected at early stages and for precision treatments. Press release by Paso Robles SEO company Access Publishing, 806 9th Street, #2D, Paso Robles, CA 93446. (805) 226-9890.